With 10 days to go until I start my tour this weekend mostly consisted of training, planning, shopping, mild panic, and eating. I still managed to fit in a few beers though – got to maintain a balanced diet after all. After a hectic week at work it was really nice to go out Friday evening. A group of us went to the appropriately named Bicycle Shop, a restaurant on St Benedict’s Street (Norwich) that also has a funky bar downstairs; the Bicycle Bar. Several ales were duly consumed whilst commiserating over the English house buying process – you can go all the way through the process, paying for searches, solicitors etc, but before you exchange it means nothing and the seller can just pull out, potentially losing you a lot of money. Happened to a couple of friends and doesn’t seem at all right, I believe the Scottish system is probably a lot fairer. Anyway I’d recommend the Bicycle Shop, and St Benedict’s Street in general for going out; The X Bells serves excellent cocktails! Also met up with Tom who’s planning on taking his show to the Edinburgh festival this year, and has set up a Kickstarter project to raise funding – well worth a look at their Faileontology trailer. I know the guys would welcome any support so feel free to share the link! As a consequence of Friday evening’s activity Saturday was a little slower starting than anticipated, however I duly loaded up my bike, which seems to be getting heavier with each outing, and headed out into the glorious sunshine. Still a little cold but fine once you get going, and there were plenty of warming hills to struggle up; please refer to a previous post concerning Norfolk really not being that flat, not when you have a fully loaded touring bike anyway. A 72 mile training ride through the countryside down into Suffolk ensued, for once without a headwind to speak of, passing through Caistor St Edmunds and the old Roman town there, then on to Saxlingham, Halesworth, and through several more picturesque and decidedly sleepy English villages before reaching Beccles. I’m not sure what it is about moderately sized Suffolk towns but they seem to make my GPS device (Garmin Edge) go a little senile. As with Bungay it proceeded to send me around in a few circles, attempt to cross a fairly large river where there wasn’t a handy bridge, and send me down a one way street the wrong way. 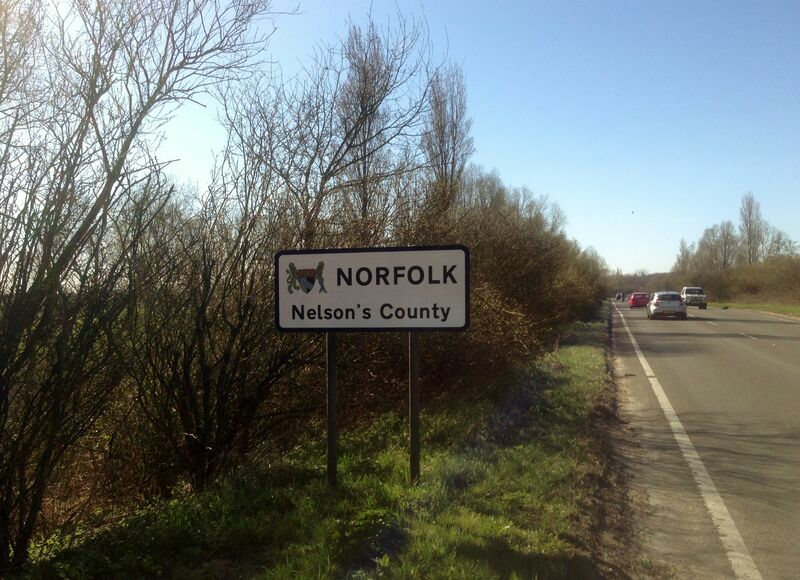 I eventually did make it out of Beccles, but was quite thankful to cross over back into Norfolk where electronic devices seem less prone to randomness. Also managed to buy some of the last things I need, aside from food, including the all important Chamois cream and a new outfit – bib and cycling jersey from Northwave which I’m sure will look very ‘fetching’, if you’re into lycra that is. Must update my kit-list page. Sunday was again good weather so I headed North to Blickling Hall, on a 45 miles route which I’ve done several times now. It takes me up to Reepham, on to Blickling Hall, then back to Norwich via Coltishall and Wroxham, all for the most part on pleasant country roads; aside from the potholes, ruts, debris from tractors, horses, cows etc, and the ‘interesting’ smells associated with pig farms. Can’t complain though, bacon has to come from somewhere and is a vital part of my balanced diet. Few pictures below, quite a few of churches as Norfolk has a lot of them. I believe all the landowners used to build churches for their tenants. It must have been some kind of competitive status symbol, and obviously to demonstrate ones devotion. They dot the landscape coming in various shapes, sizes, and degrees of embellishment – hence competitiveness. They’re almost as common as pubs, although sadly the latter are prone to closure these days, which is sad considering the fine quality of real ale being produced in the county. Just after Blickling I had to mend a puncture, which thankfully I haven’t had to do in a while, and hopefully won’t have to do again for a bit. I’m down to one spare inner tube now so best get some more before setting off, although I will try and repair inner tubes where practical. Ended up with very grotty hands for the rest of the ride which reminded me I need to clean my bike before setting off on 01 May. Met quite a few really nice people whilst out cycling this weekend, mostly other cyclists, but also people who were in general interested in what I was up to and how far I’d cycled. Really encouraging to have a good chat when you stop for a break. Last full week of work next week and lots to do, both on the work front and final planning activities before setting off the week after. Best make a list, I have lots of lists, thankfully most of them have lots of ticks on them, hence only mild panic at present. On a parting note I’m now almost completely addicted to Haribo Tangfastics. Sadly I can’t claim they’re really part of my ‘balanced’ diet, but they really do help when your legs are close to giving up as I’m sure some of those who ran the Virgin London Marathon today would agree – congrats to everyone who took part and great to see it go ahead successfully after the sad events in Boston last weekend. P.S. Thanks to Norman and Sheila for the Roast Chicken dinner this evening, and the flapjack, and the rejuvenating pint! 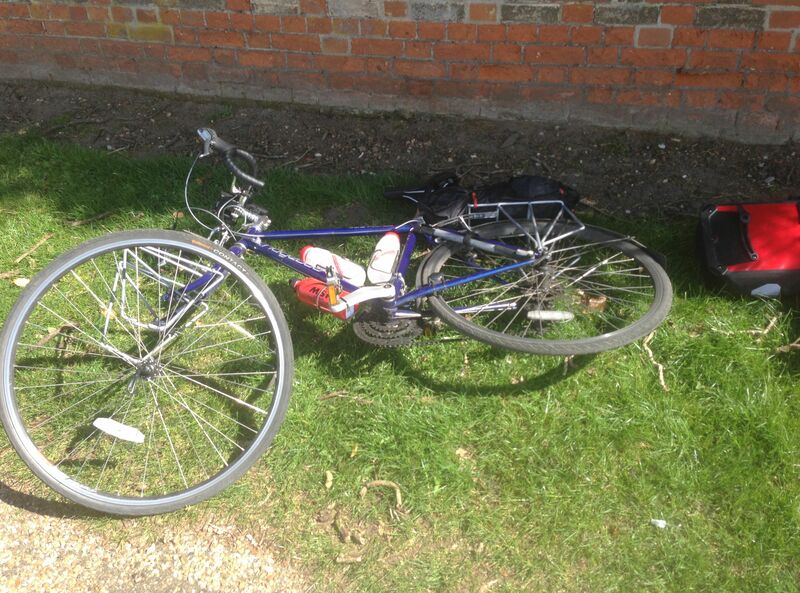 This entry was posted in Bike around Britain 2013, cycle tour kit, General, Training and tagged adventure, balanced diet, bicycle shop, bike, countryside, cycle equipment, cycle touring, cycling, Norfolk, Norwich, outdoors, photos, Real ale, Suffolk on April 21, 2013 by SelfPropelled. Really enjoying the blog, James! Ah – the old “Kinger” at Reepham – a regular haunt when Wayne, Pete and I used to work there! And an appropriately creepy shot of St Michael the Archangel too – did you stop off to look inside at the crazy angel carvings?.. Those angels are slightly creepy, a bit Doctor Who ish, so just cycled on past without blinking.